A nursery that couldn’t help but please. Your whispers on the wind began to fade. 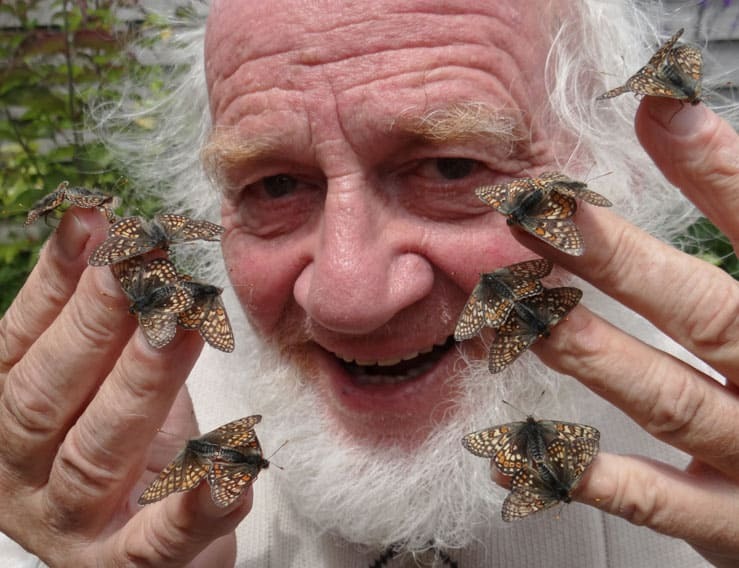 One of the researchers of this study (Professor Michael Singer) poses with the butterflies being studied (Photo Credit: Michael Singer). This is an Heroic Rispetto, inspired by recent research which has found that human-induced evolution amongst wild animals can cause localized extinctions when the practices that brought about this evolution rapidly change. Edith’s checkerspot (Euphydryas editha) is a species of butterfly that is found in the Western parts of North America. By studying the behaviour of this butterfly in a spring-fed meadow on a family-run ranch in Nevada over a period of 30 years, researchers have shown how human processes have led to their localised extinction. Traditionally these butterflies would lay their eggs on the Blue-Eyed Mary (Collinsia parviflora) plants found in this meadow, but this changed when the narrow-leaved plantain (Plantago lanceolata) was introduced to the USA in hay brought from Europe around 100 years ago. The caterpillars of the Edith’s checkerspot had a better survival rate when hatched on this new species of plant, causing the adults to evolve a preference for laying eggs on them, and by the mid-2000s, these butterflies were 100% reliant on the plantain. However, in 2005 the ranch’s cattle were removed due to financial pressure, and without grazing the plantains became embedded in the surrounding grasses, cooling the micro-environment and leading to a localised extinction of the Edith’s checkerspot, whose eggs could not hatch in the new, cooler, conditions. The Blue-Eyed Mary was unaffected by the removal of cattle, so if the butterflies had not evolved so rapidly in response to the introduction of the plantain, they would most likely have survived. Furthermore, around five years after the extinction, Edith’s checkerspots recolonized the meadow, although since these butterflies were all found to be laying their eggs on the Blue-Eyed Mary, the researchers believe them to be a new population, with the original lineage now fully extinct. Similar evolutionary traps likely exist in many other environments, where human processes encourage rapid evolution amongst wild species.